This Whole30 recipe is easily becoming one of my favorites. I have made it multiple times for dinner and for lunch. 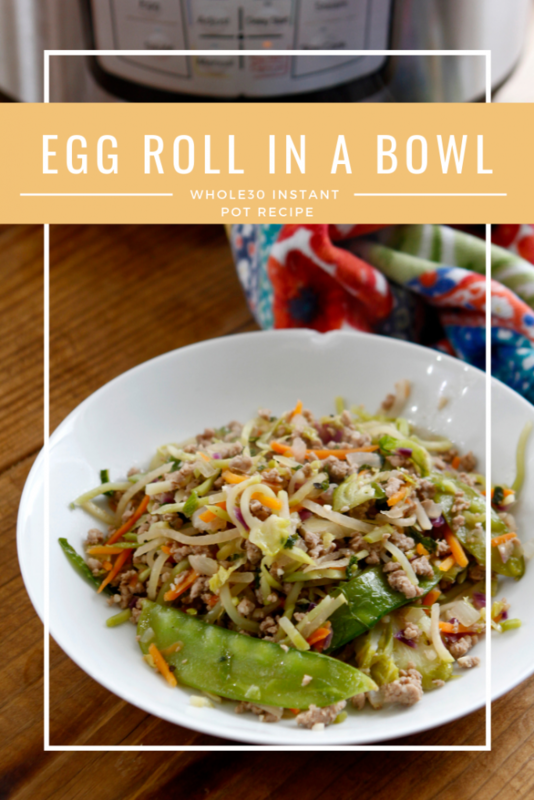 If you are on the hunt for Instant Pot recipes, and you want to eat clean, this Egg Roll in a Bowl is one to add to your list. What I love about this recipe is that it does not use the Instant Pot as a pressure cooker, instead it uses only the saute feature to cook this dish. This is a meal that is done from start of finish in less than 20 minutes. Perfect for a busy weeknight or any day of the week when you’re needing to get dinner on the table fast and still eat well. Who knew you could create a stir fry recipe without all the bad stuff at home. It’s better than Chinese food takeout any day of the week! Get more recipes just like this in our Instant Pot Whole30 eCookbook. Add the ghee to the insert. As it starts to melt add in the garlic (If you’re using it… I highly recommend! So much flavor!) and your diced onion. Saute them for 3-5 minutes or until the onions are translucent. Stir them often to prevent burning. Isn’t it amazing that you can cook in this appliance without ever turning on the pressure cooking feature? It’s like it’s an extra burner or skillet in the kitchen. One pot meals like this are perfect for this feature! Add in the ground pork and use a meat chopper to make the pork super fine as it is cooking. You will see me using it in the video where we show how to assemble this meal. 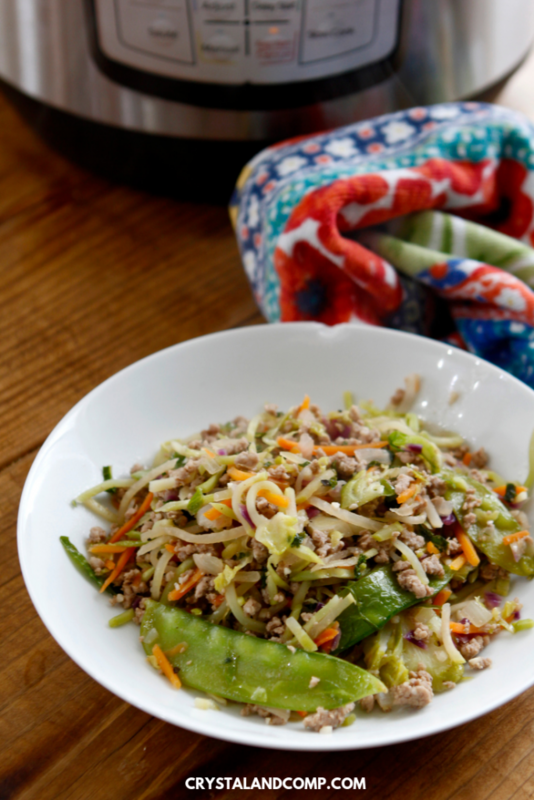 Once the ground pork is done cooking, toss in the slawed veggies and the snow peas if you are using them. Add in the rice wine vinegar and the coconut aminos. Continue to saute, stirring as needed to combine and prevent burning, for 10 minutes. You can top with some sesame seeds if you want. That is yummy! If you love this recipe and like the convenience of printing it off along with twenty other clean eating recipes for your electric pressure cooker, check out our Whole30 Instant Pot eCookbook. Yes, you can! As long as it is clean and does not have any additives or extra stuff added to it. You could totally ground chicken yourself at home. For the beef you just want to ensure it is grass fed. This is made from the sap of coconuts. It is dark in color and salty in taste and is an awesome alternative to soy sauce. It is gluten free and soy free. Coconut aminos are Whole30 compliant and one bottle will last a while. Ghee is clarified butter that has the dairy removed. They say it is better for you than butter. Many Whole30 recipes use ghee when cooking, just like we did for cooking the ground pork. A container really can go a long way. Don’t want to use ghee in this recipe? You could use extra virgin olive oil instead. If you’re looking for Instant Pot recipes that will allow you to use your electric pressure cooker, you’ve come to the right place. 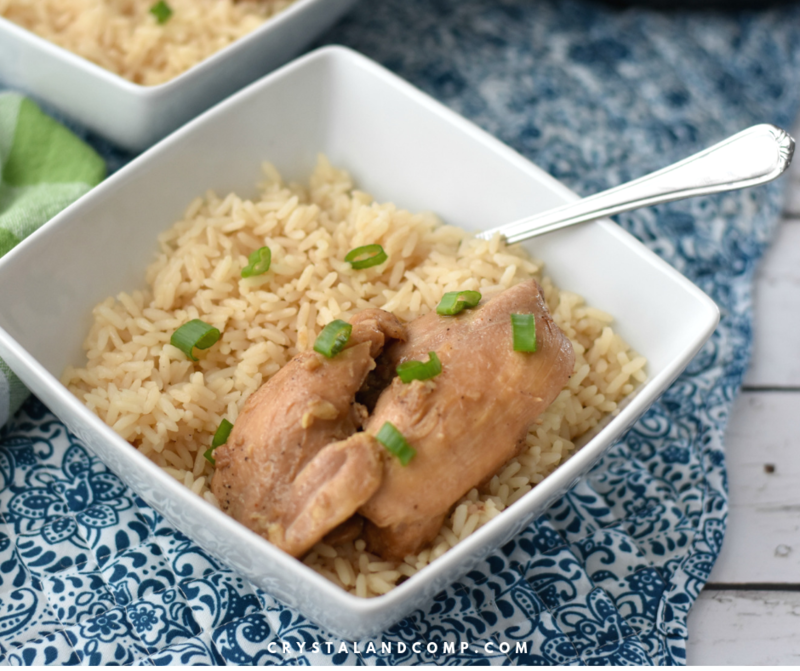 This Instant Pot Chicken Adobo recipe is mouth watering and perfect for large families with busy schedules. This recipe requires no baby sitting, uses simple ingredients and pairs perfectly with brown rice. 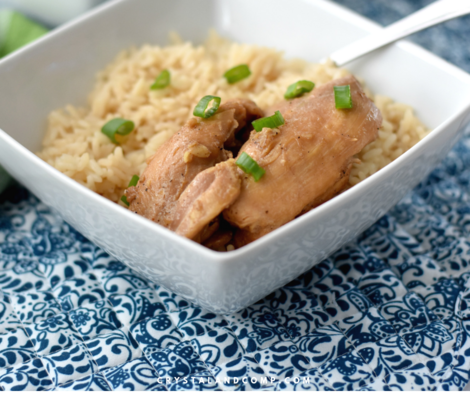 The vinegar and soy sauce base, goes perfectly over rice with the chicken. If you are a large family like mine, double this recipe. As it is written it serves 5-6 people. 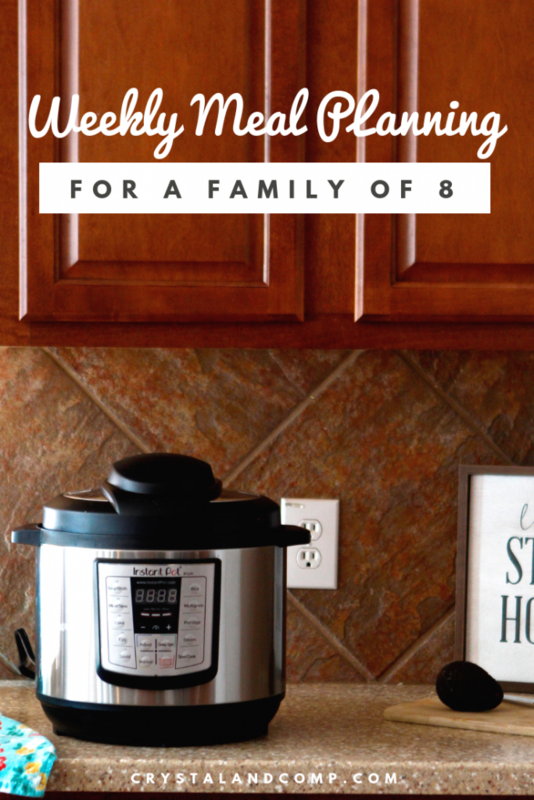 Since we have a family of 8, like leftovers and often have extra people over at dinner time, I double this recipe and use an 8 qt Instant Pot. Season both sides of chicken thighs with salt and pepper. First we are going to saute the thighs. Add olive oil to the stainless steel insert. Add chicken and saute them. It does not have to be perfect. I advise you saute them for 2-3 minutes on each side. Cancel the saute mode soy sauce, vinegar, onion, garlic, and cayenne to the pot. Use a rubber spatula to deglaze the bottom of the pot moving the chicken around. Top with onions and bay leaves. Lock the lid on and set to vent to sealed. Now you want to press the Manual/Pressure Cook button and set the time to 10 minutes. If you are doubling the recipe cook for 12 minutes. When the Instant Pot countdown finishes, release pressure completely. You can do a quick release on this dish if you like. Now press the saute mode and boil about 10-15 minutes or until sauce thickens. 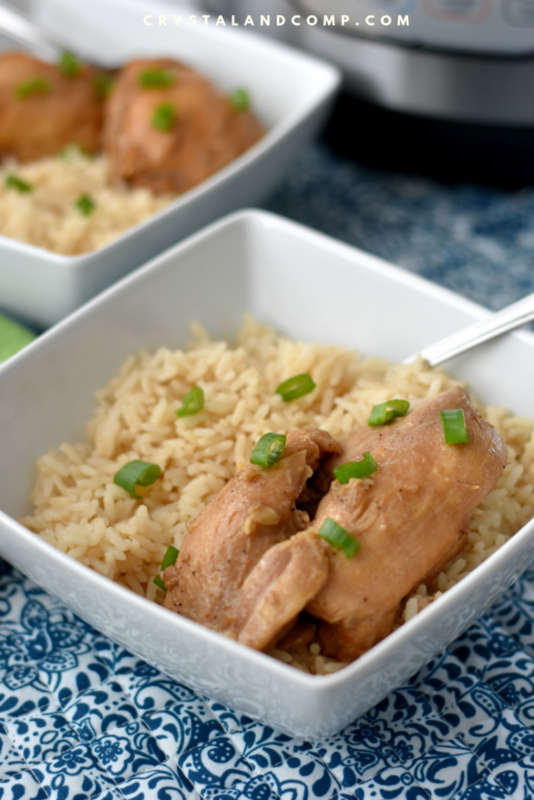 Serve chicken and sauce in a bowl over brown rice. Garnish with green onions. Serve this with Instant Pot Brown Rice, which cooks in 22 minutes. I don’t make brown rice any other way now. I like to cook up a bunch in the pressure cooker and freeze it into freezer bags and pull it out and heat it up in the microwave. If you have two pressure cookers then you can have one going with dinner and one going with rice. Or, use a rice cooker to make your rice. If you prefer, you can use white rice instead. 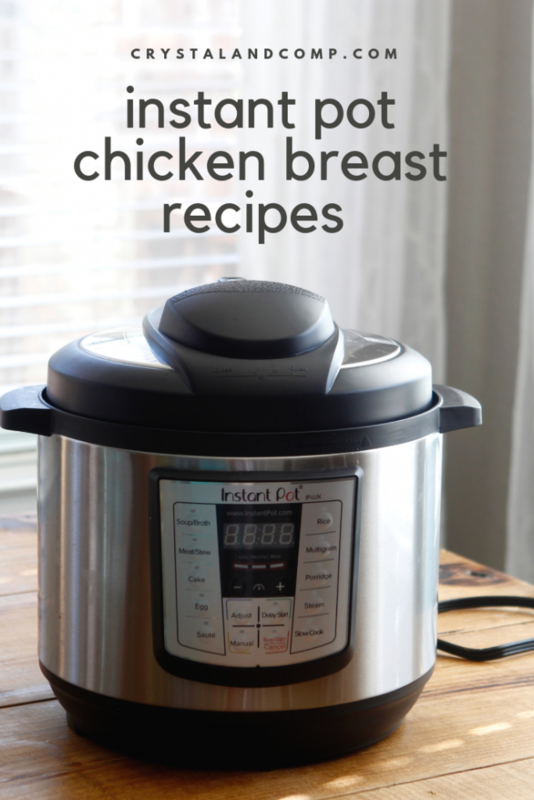 How Do you Cook Chicken in the Instant Pot? Remember, anytime you’re cooking anything in the electric pressure cooker you have to have at least one cup of liquid in the insert. The liquid boils under pressure and cooks the chicken quickly. 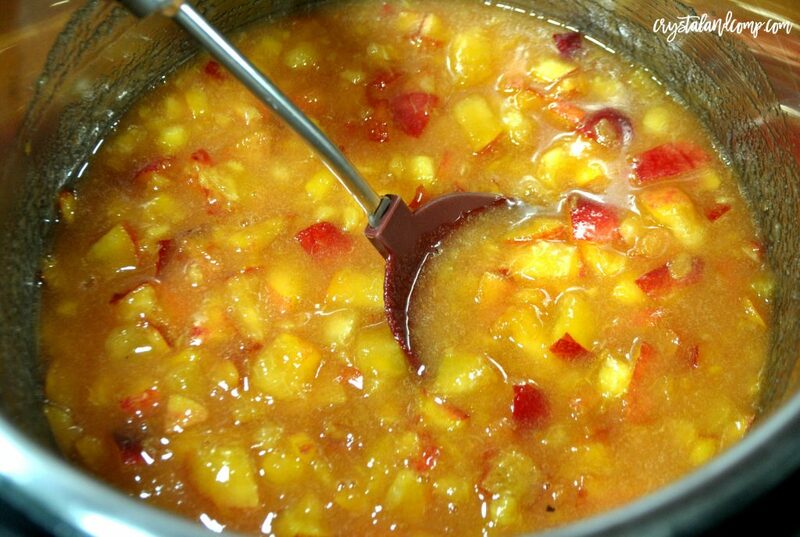 You can cook any recipe you would typically make in the oven, on the stove or in the pressure cooker in your Instant Pot, you just have to adjust your liquid level and your cook time. 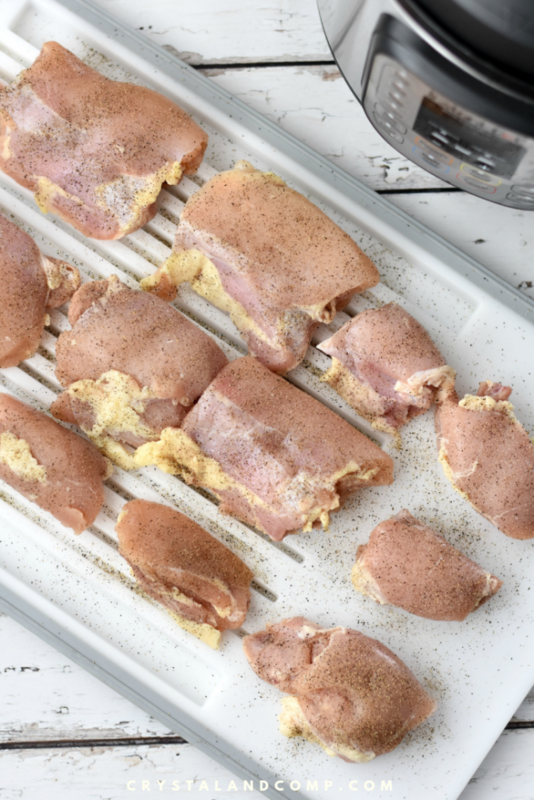 Can You Cook Frozen Chicken in the Instant Pot? Yes you can. You just need to add more cook time. I would add 2-3 minutes of cook time if your chicken thighs are frozen solid. 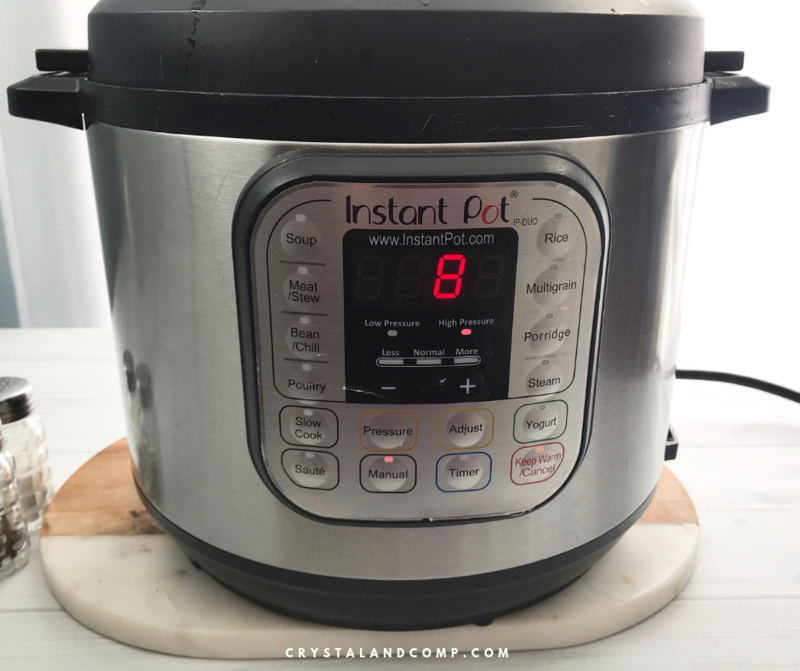 How Hot Does an Instant Pot Get? The Instant Pot brand heats up to about 242 degreesFahrenheit. This is only one brand on electric pressure cooker. Other brands heat up to about 250 degrees Fahrenheit. If you have an Instant Pot brand and you feel like your recipes are coming out a little underdone, increase the cook time by 1-3 minutes. Instant Pots cook at a lower temperature than other brands of electric pressure cookers. 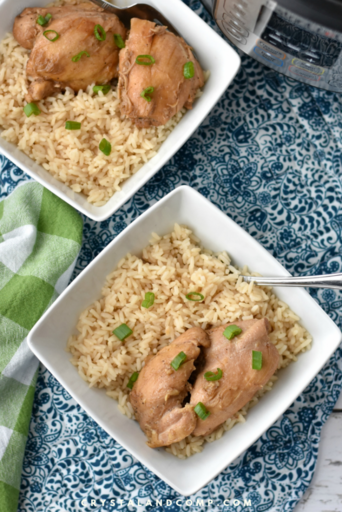 If you have never made chicken in your instant pot then you are truly missing out on life! 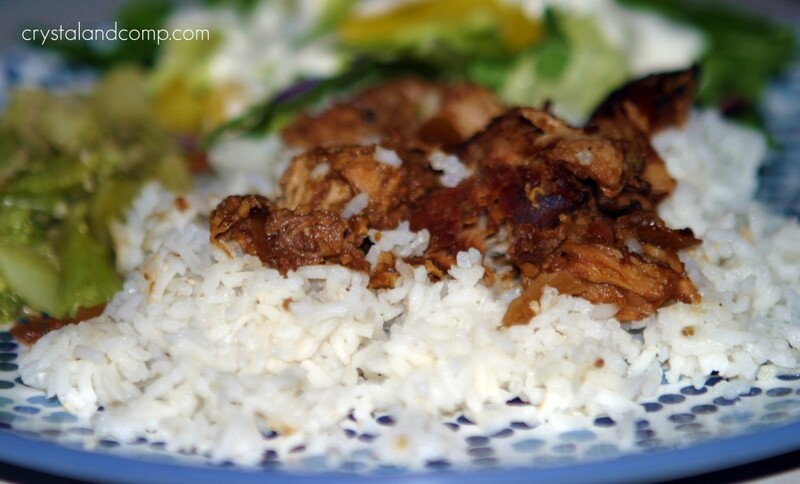 Chicken is one of the easiest and most versatile proteins there is and we eat A LOT of it. 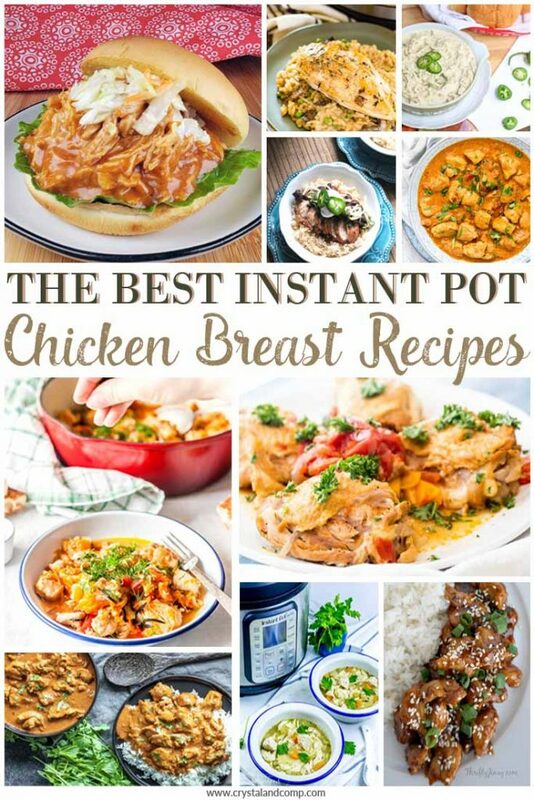 I love a stockpile of good instant pot chicken breast recipes and there are seriously so many options out there. 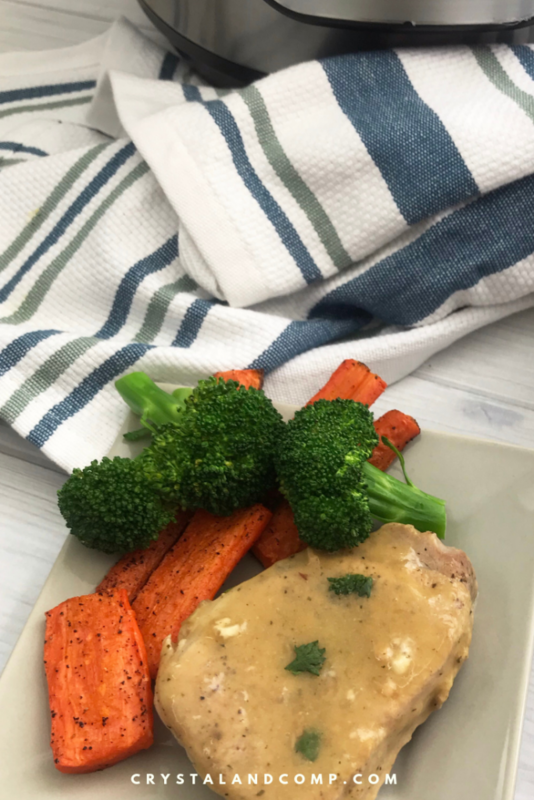 Here are some of the best around when it comes to making a flavorful instant pot chicken breast recipe! Check out all of our Instant Pot recipes while you’re here as you meal prep for the upcoming week. 11. This Whole30 Chicken Soup is packed full of flavor and is amazing! 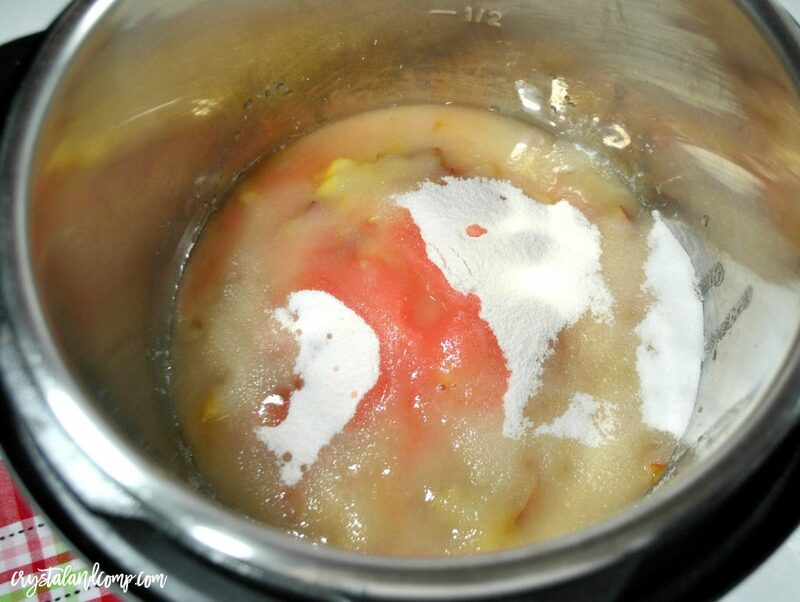 Soup is a great way for cooking chicken in the electric pressure cooker! Just sub out the thighs for breasts. Crystal & Co. When you are cooking in your Instant Pot, you might have some questions about what some of the terms mean in these recipes. This is totally normal, especially if you’re new to using your Instant Pot. What Does Manual High Pressure Mean? If you have an older Instant Pot or electric pressure cooker, pressing the “manual” button is telling it you want to pressure cook. On some of the newer Instant Pots and electric pressure cookers there is a button that actually says “pressure cook” on it. Not matter which one you do, manual or pressure cook, it is automatically going to give you high pressure. So, high pressure means it is cooking the contents at the highest level it can. Remember, you always have to cook with at least one cup of liquid in the electric pressure cooker. That liquid, depending on the level of pressure you’ve selected is going to be heated up to as high as 240-250 degrees. The Instant Pot brand actually heats up only to 242 degrees where some of the other brands can get up to 250 degrees. How Safe is an Electric Pressure Cooker? I get asked this question all the time and I think people have heard lots of scary stories about the electric pressure cookers our grandmother’s may have used back in the day. This guy is full of great information. He agrees that electric pressure cookers are suited for people with busy lives. He shows us how they work and just how safe they are. What Does Natural Release Mean on the Instant Pot? It means what it says. By allowing the steam and pressure to release naturally this means you are letting it leave the electric pressure cooker slowly and you are NOT using the Quick Release option by turning the sealed valve to open once the meal is done cooking. By doing the natural release function it will take 15 minutes or so to release the pressure which will then allow you to unlock the lid and open it. Honestly, for chicken it is totally fine to do a Quick Release. I like to use Natural Release when I am cooking meats that need to rest after cooking. I always Natural Release my beef, for example. Some of the recipes for chicken breasts might tell you to saute before you actually put the food under pressure. Did you know you can do this right in your electric pressure cooker. No need to dirty up more dishes. In this video I show you how I used my Instant Pot to saute olive oil, onion and garlic before I added my chicken and other ingredients to make a chicken soup recipe. 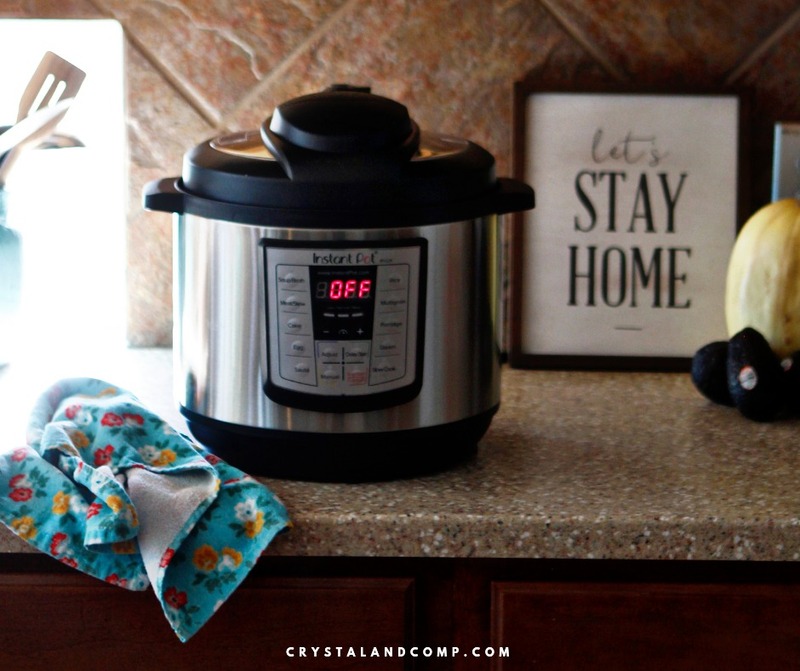 Let me just tell you, if you struggle with getting dinner on the table Instant Pot recipes are something you need to look in to! By using an electric pressure cooker, you can cook dinner quickly- just dump and go. Set it and forget it. 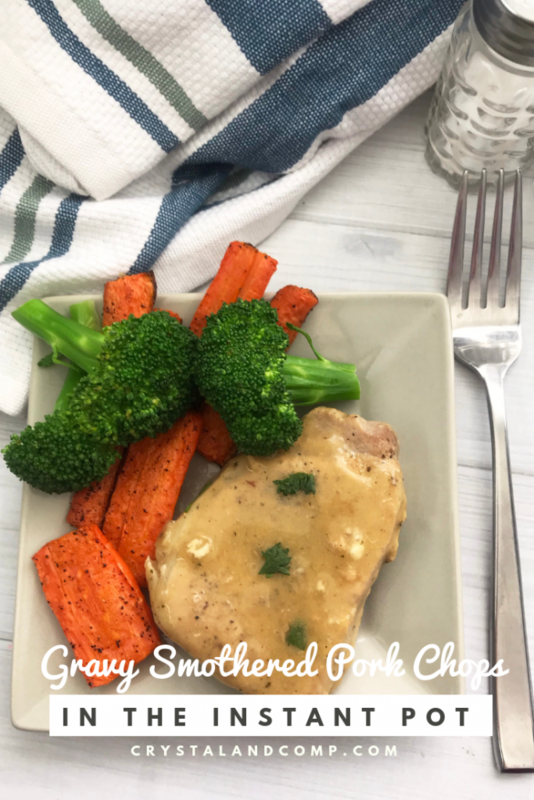 These Instant Pot Smothered Pork Chops are perfect for a busy night when you want a home cooked meal and do not want to spend hours over the stove. First gather up your ingredients. 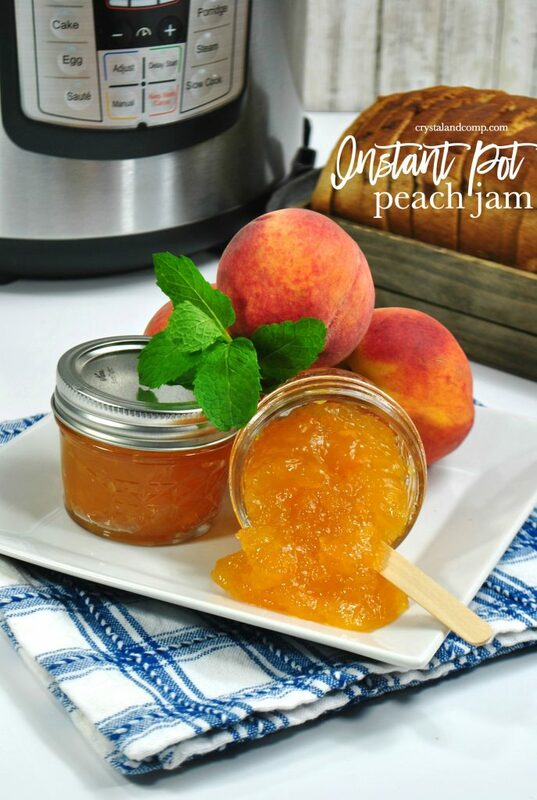 If you are using an 8 qt Instant Pot, you can double this recipe. That is what I do for my family. If you are creating the recipe as is, a 6 qt Instant Pot will be perfect. First you want to salt and pepper the pork chops. Also, lightly dust them with the garlic powder. We are going to start off using the Instant Pot in the saute function. Place the metal insert into the pressure cooker and push the saute button. Add the olive oil (or ghee if you’re using it) and minced garlic into the bottom of the insert and let it heat up. Add the pork chops evenly to the insert and brown each side for 2 minutes each until lightly brown. In a small bowl add the broth, cream of chicken soup, gravy packer and ranch dressing to the bowl. Use a whisk to combine well. Now that the pork chops are browned on each side, pour this mixture over them. Pop the lid on the Instant Pot and lock it in place. Ensure the vent is set to sealed (closed). Choose high pressure and manual and set the timer to 10 minutes. If you’ve never cooked in your electric pressure cooker, the timer will set and beep. Once it does this the pressure cooker will begin to pressurize. As it is doing this you will hear a gurgling sound inside the machine. This means it is working! Once it reached the needed pressure then the cook time will start and the timer will come on counting backwards until done. Once the timer goes off you have two choices. You can allow the pressure cooker to do a natural release of the pressure and steam inside. If you choose to do this there is not anything you need to do when the cook time is up and it beeps. You need to just wait for all of the pressure to release naturally. This could take 10 minutes to 20 plus minutes. Once all of the pressure if out, the lid will unlock and you can remove it. Be careful, there is still steam inside. I would open away from you, careful not to burn yourself. If you want to do quick release you will turn the valve on top of your machine to vent. When you do this steam and pressure will come out of the valve area. All of the remaining pressure inside the machine will come out. This will take 2-5 minutes, but as soon as it is done the lid will unlock and you can serve your dinner. Serve the pork chops with noodles, rice or potatoes and a veggie. When pork chops are done they should be a grey-white color. Jut cut into them and ensure all of the pink is gone and you see a grey color. They are known as the other white meat. I have kept cooked pork chops in the fridge for 5-7 days. As long as they are cooked thoroughly and kept in the cold fridge, they are fine to reheat and eat. Many people discard leftovers too quickly, in my opinion. You can! 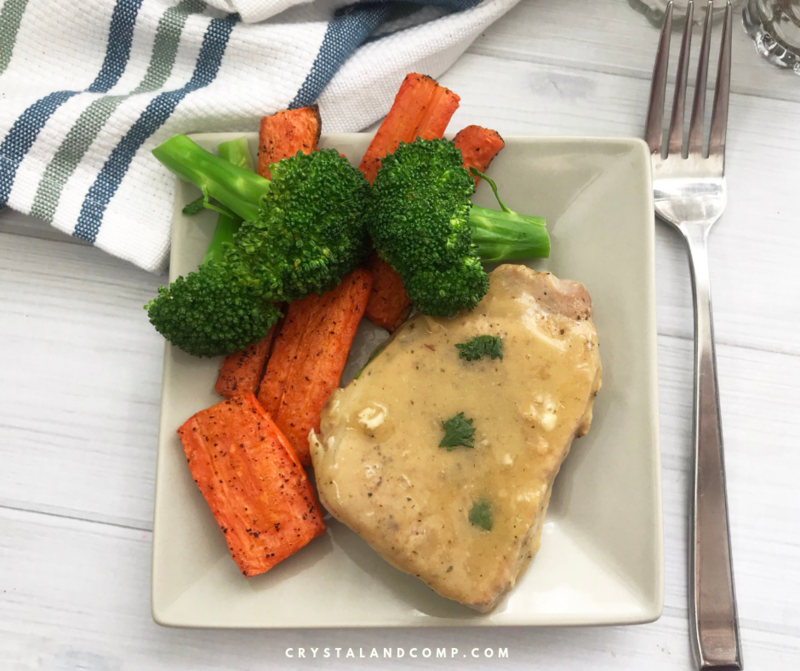 I love this slow cooker smothered pork chop recipe. Cooking them low and slow gives you a super tender pork chop. This particular recipe creates more of a smothered mushroom gravy, which mushroom lovers will really enjoy! The pork chops may become so tender they are more like a chipped pork, which is perfect over mashed potatoes! 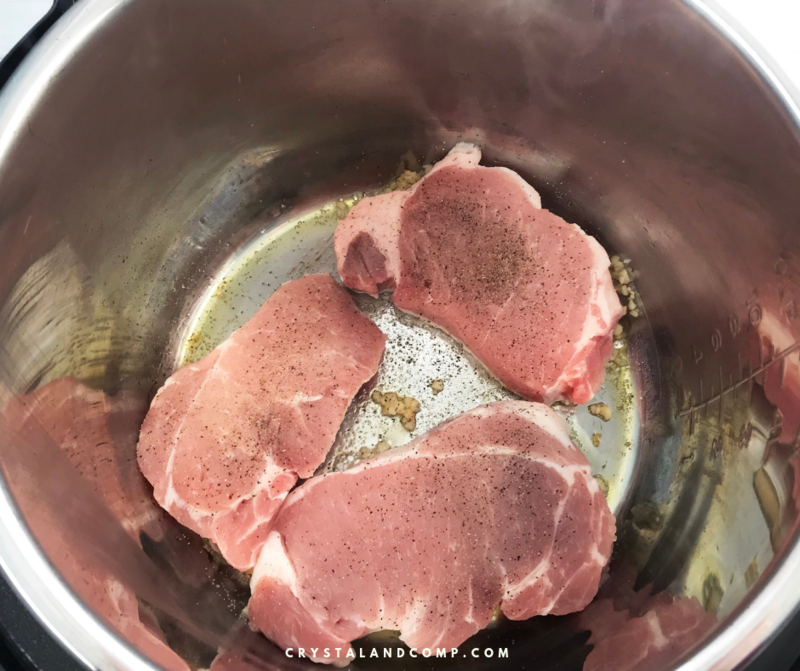 If you choose to cook a thinner cut of pork chops in your Instant Pot following this recipe, you can double the amount of pork chops and cook it for the same cook time as stated in the recipe. Or, you can cook the same amount of pork chops as indicted in the recipe but for 2 minutes less. You can! I have been doing something for a while where I take all of my cooked, leftover meats, any broth, any non-dairy sauces and I store them in a large container in the freezer. Just dump them in. Yes, it all mixes up and yes it is good. It can be ground beef, leftover pork chops, spaghetti sauce, shredded or diced chicken, etc. Once my container is full I thaw it and add some broth or water and some veggies and make a leftover soup. It is so good and a great way to use up leftovers. I got this idea from a friend and love it! Obviously you would be adjusting the recipe for different cook times depending on which method above you choose. Add the olive oil (or ghee if you're using it) and minced garlic into the bottom of the insert and let it heat up. If you've never cooked in your electric pressure cooker, the timer will set and beep. Once it does this the pressure cooker will begin to pressurize. As it is doing this you will hear a gurgling sound inside the machine. This means it is working! Let’s face it, moms need meal planning. It is the key to running a smooth week and getting dinner on the table. When dinner time goes bad (no planning, missing ingredients, eating late), we end up giving up and just heading out for drive thru. I have a large family of eight at home. Our large family meal planning routines are in place and I know exactly what needs to happen so dinner is on the table and we are not eating out. Here is how we have healthy kid friendly meals on a budget. Let me say this, if you are on a budget and need to cut costs, fast food is a money pit. What you are spending on food needs to be streamlined. Especially if you are a large family, but this applies to any family. I can tell you, there was a time when I bought Starbucks multiple times a week. We would drive thru our favorite chicken sandwich place a couple of times a week. Anytime our family eats lunch or dinner thru the drive through the bill is easily $55. Easy! That adds up. You can easily toss $150 out the window by just eating three meals out. Or, you can buy almost an entire week of groceries for a family of eight on $150. That does not even count the cost of high end lattes! I will be honest. When we moved from our 1,800 square foot house to our almost 4,000 square foot house (yay!! room for everyone… finally!!) I worried about the cost of our mortgage. We had never paid a house payment like this before. Never! Drive thru was the first place that I knew we had to cut costs. Limit the sit down restaurants to only date nights. Taking this large family to a restaurant is easy $100 and half the time I leave knowing I could have prepared a better meal at home. And, half the time you pay for food the kids do not eat. That has stopped! Sit down. Make a plan. Make a grocery list. Shop. Cook dinner. Every night! You can use our meal planning pack to help you. Don’t get me wrong, we still have our favorite chicken sandwich from time to time. It is incredibly limited. I am here to tell you it is the best way to streamline your to do list. And do not for one minute think this is you being lazy. That is bologna. You cannot do everything. 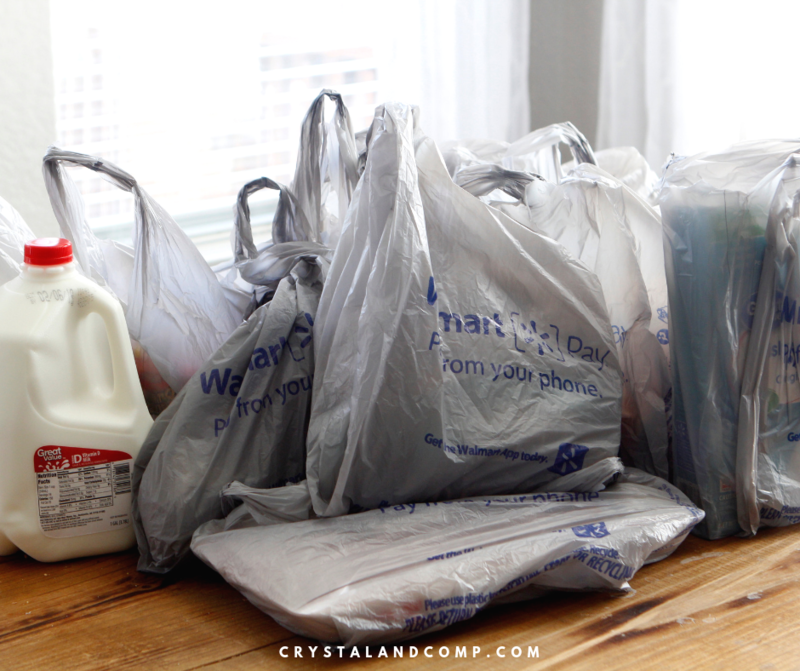 People want to talk about finding balance in our lives as a mom, grocery pickup is one way to do that. Grocery shopping is at last one hour of tour time each week. Add taking kids to the store with you and you can tack on another thirty minutes. You are wise to outsource things that save you time, money and sanity. It keeps you from overspending- you don’t click checkout until your cart is at a dollar amount that meets your budget. You won’t impulse shop because you are literally buying what is on your list and your eye is drawn to nothing else. Your kids are not pulling you from the grocery list you walked into the store with. You only put in your online shopping cart what is on the list. Worried you will buy a product not knowing what the ingredients are? Maybe you have special dietary restrictions to consider? Maybe you’re a mom wanting to avoid high fructose corn syrup? Maybe you’re on a special diet and need to pay attention to sugar intake, calories etc. 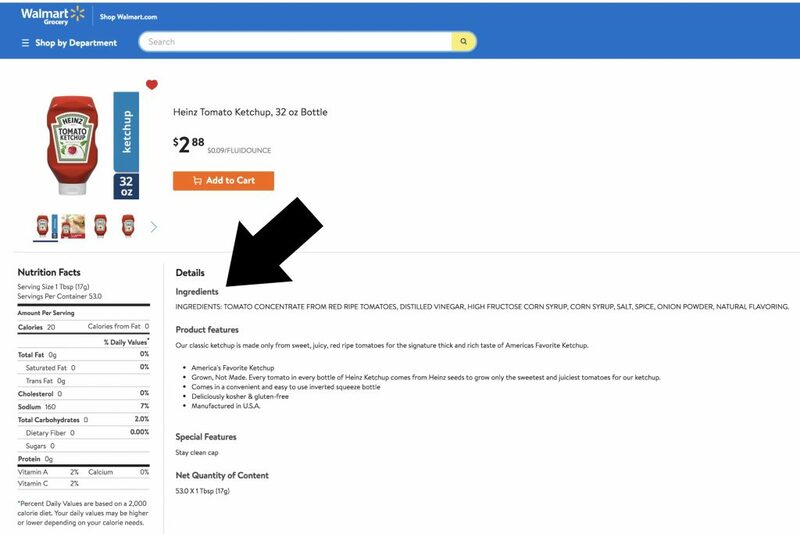 Walmart tells you all of the ingredients of each item as well as nutritional information. No crowds. No impulse shopping. No over spending. I am the first the encourage you to utilize resources that will help you get dinner done quickly. With a lot of children at home I do not want to spend two hours of my evening cooking. I have a lot going on. But, I do want to serve my family a delicious meal that is good for them. A couple of things I have in my kitchen that I suggest every large family (or any busy family for that matter) has in their kitchen as well are; electric skillet, electric griddle, programable slow cooker and an electric pressure cooker. Because our family is large I have an 8 qt pressure cooker. I also have 6 qt and 7 qt slow cookers. Whole30 Instant Pot Pulled Pork– I will use orange juice and a few other ingredients for the base when cooking the pork roast. I am going to serve it with power veggie slaw my for myself and my husband. For the kids I will serve it on Hawaiian rolls like sliders. You can get this recipe and twenty-one others in our e-cookbook that is all Instant Pot and all Whole30. Understand that you do not have to do Whole30 at the most restricted level. It is a great way to just begin with cleaner eating. 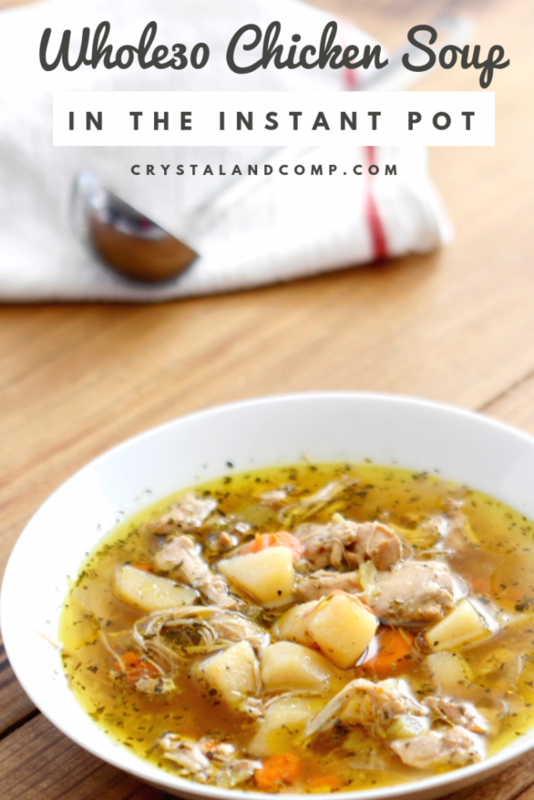 Instant Pot Whole30 Chicken Soup– full of flavor. Full of veggies; carrots, potatoes, onion, celery. I could eat this multiple nights a week it is that good. I ate my just as it was. The kids had crackers with theirs. And it’s quick and easy! Mongolian Beef Stir Fry– this is another recipe from our downloadable cookbook. It uses orange and red bell peppers and fresh broccoli. For the meat you slice up a three pound roast. You add in some red pepper flakes too. This is one of the handful of recipes that uses coconut aminos (instead of soy sauce) and date paste (instead of sugar). Honestly, I think you will be pleasantly surprised. One of my readers told me she has been using coconut aminos for years instead of soy sauce. It is a pantry staple for her. I can understand why. I served this to my kids like rice bowls, for myself I used cauli-rice (buy it frozen or you simply take a head of cauliflower and run it through the food processor. I sauté it in olive oil and a little salt and pepper. Super good. Set the Instant Pot for 20 minutes and boom- you have dinner! Balsamic Pork Chops– this is another Whole30 recipe that is cooked in the pressure cooker. It also uses date paste for a sweeter. I am going to serve this with asparagus and baked sweet potatoes. I want you to remember good Whole30 and clean eating recipes allow you to eat chicken breasts and thighs, ground beef and pork, you can roast chicken and you have access to fruits and vegetables galore! What is on your meal plan this week? Would love to know what some of your favorite healthy kid friendly meals are when you’re on a budget. Have you created your meal plan this week? For us I like to do this over the weekend and plan for the upcoming week. 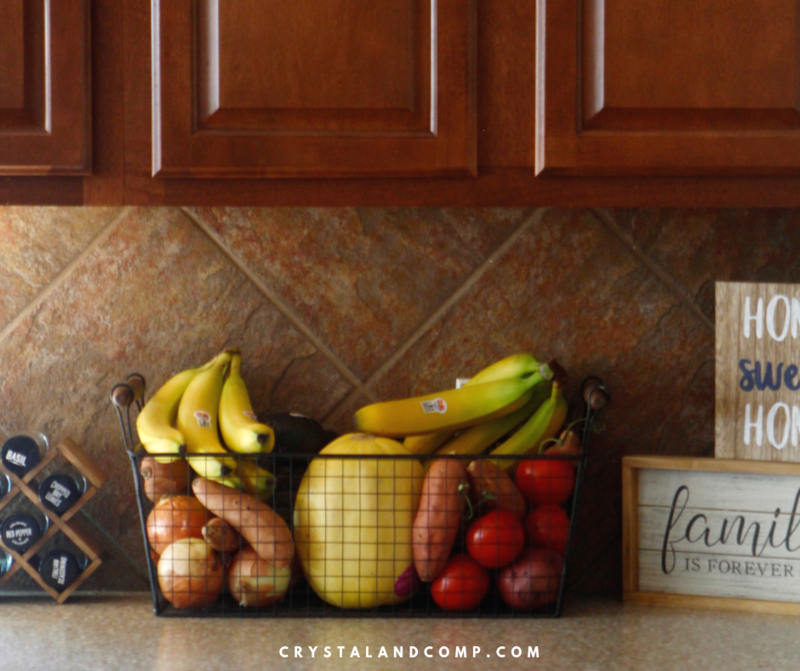 I sit down, write out our meals, create shopping lists, order my groceries online and get them picked up and stocked in the fridge and/or pantry. 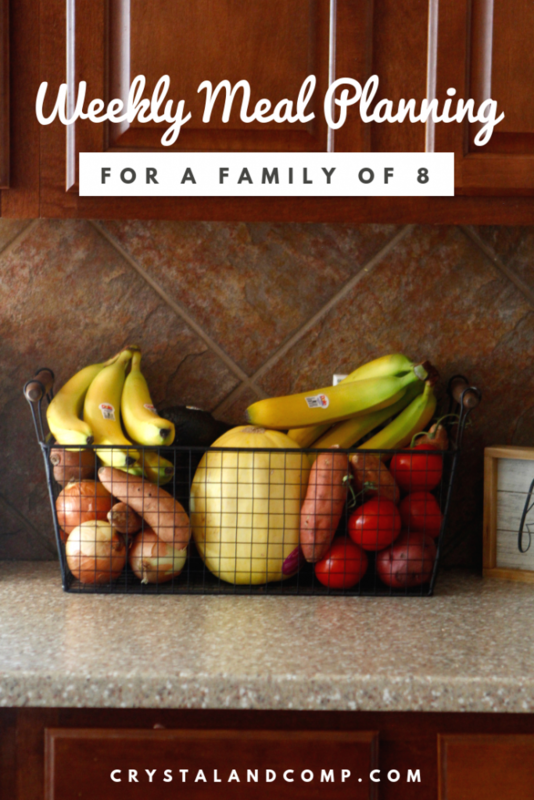 Large family meal planning is something that has ben instrumental in helping us stay on budget, stay out of the drive thru lines and keep real foods in our home. 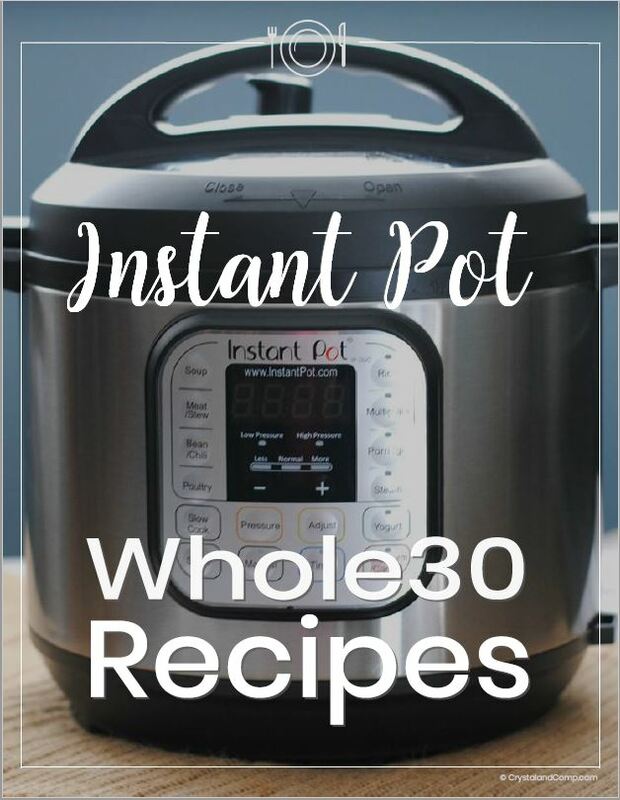 I am going to show you how Whole30 Instant Pot recipes can help you create good for you recipes for the entire week that your family will love. Plus the Instant Pot is one of my favorite kitchen appliances. if you’ve never tried pressure cooking, you should! My husband is trying hard to shed some points. I am doing everything I can to support that. For 14 days he is doing something called the Daniel Fast. I am working on pulling some recipe ideas together for you guys to show you more about the Daniel way of eating. In the meantime, I cook a simple vegetable based meal for him and then create a Whole30 recipe for the kids. Sometimes I eat what my husband is eating and sometimes I eat what the kids are eating. This is only for 14 days… and we are 7 days in so halfway done. Whole30 allows you to have meat. The Daniel Fast does not. 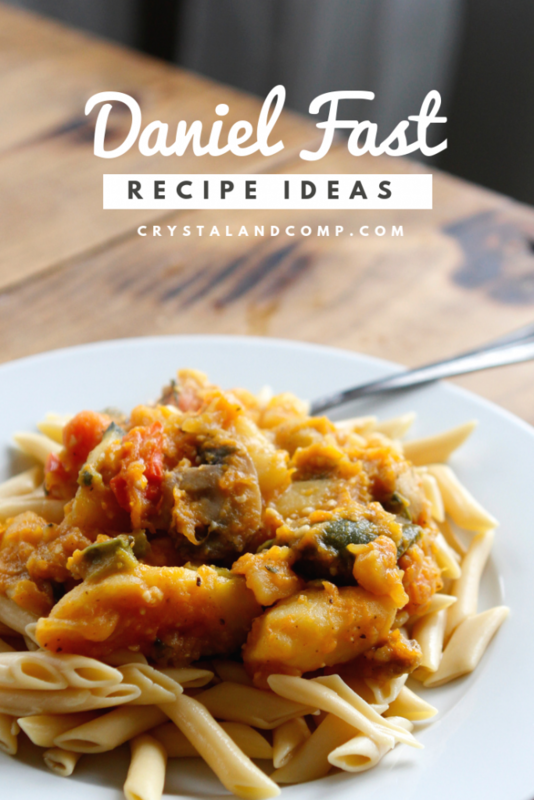 Daniel Fast allows brown rice and pasta made from vegetables or beans. Whole30 does not allow rice or pasta or beans. Whole30 allows you to cook with ghee, which is clarified butter. For Daniel Fast we are using olive oil when we cook. When he is done with the Daniel Fast he will move over to Whole30. In one week he has lost 10 pounds. I know that is a lot and not typical. But I think it’s really doing a great cleanse on his body. Nonetheless, Whole30 has been a great way to get the kids to eat better foods and to cut out sugar. It is healthy eating that is doable for families! Utilizing your Instant Pot to create Whole30 meals is a great way to get dinner done fasts and all in one pot. Whole30 Chicken Cacciatore– this is an amazing recipe. I used my 8 qt InstantPot and there was plenty of room to double the recipe if needed. 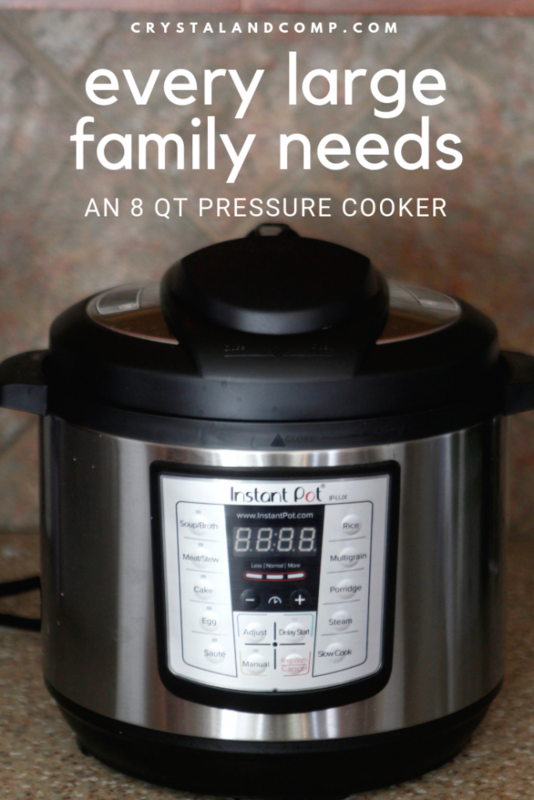 If you have a six qt pressure cooker this recipe is perfect for that size as well. The chicken and sauce are packed full of flavor. I will make zucchini and sweet potato ribbons for myself and top the chicken and sauce over it. For the kids I am going to serve theirs over steamed rice. This will be made on a travel day for my husband where he will be traveling for work. 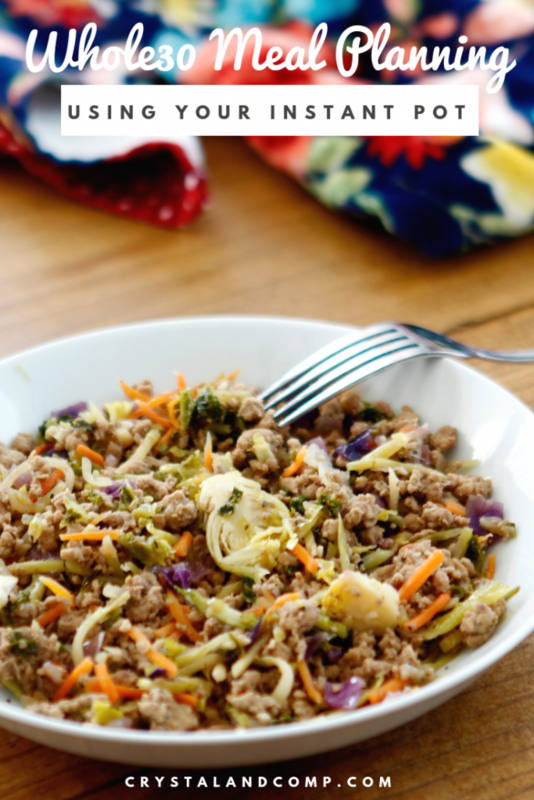 Whole30 Egg Roll in a Bowl– this is delicious! 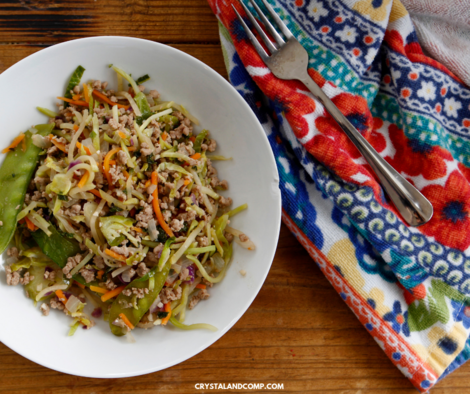 It used ground pork, (Whole30 compliant… so all natural with no sugars and junk added) and a Power Slaw I found when placing my online grocery order. The slaw has shredded brussels sprouts, broccoli, carrots, Kale and more. You use your Instant Pot in the saute mode and brown your ground pork. Whole30 Greek Chicken and Green Beans– this was made using high pressure in the Instant Pot and cooking it for 30 minutes. If you don’t have a pressure cooker you certainly could take this same recipe and cook it in the slow cooker for 4-6 hours on high. Beef Nachos– not a Whole30 recipe, but a dinner I could get on the table fast for the kids using ground beef I batch cooked and had in the freezer. This is always a safe meal to make with my kiddos and allows them to customize the toppings according to their liking. On this night my husband and I had the quinoa black bean tacos I share below. Another alternative would be to take the ground beef and add some black beans to it and serve it over a baked sweet potato. So the kids could have nachos and you can have a potato. Easy ways to modify. Lemon Butter Salmon– this was just baked in the oven but I also have a Whole30 Instant Pot version here. Leftover Buffet– use ’em up! We reinvent all kids of things with leftovers. If they don’t like the leftovers they can make a sandwich. Let me show you quickly what dinners will look like for my husband this week on the Daniel Fast. Have you ever tried it? It’s delicious! Here are some of the tools you can use to take zucchini, sweet potatoes and many other vegetables and make them into spiral noodles you can eat instead of pasta! So, this works for Whole30 and Daniel Fast. Homemade Marina Sauce– served over baked spaghetti squash. I LOVE eating my spaghetti like this! Daniel Fast Tacos– using Ezekiel sprouted wraps (Daniel approved), homemade taco seasoning, black beans and veggies. Here I share a video of how I did this. Sauted Root Veggies– served over corn quinoa pasta. What is on your meal plan this week? I would love to know! Check out our instant download with twenty two recipes that are all Whole30 and can be made in your pressure cooker! Apples are plentiful at the store and at your local orchards. 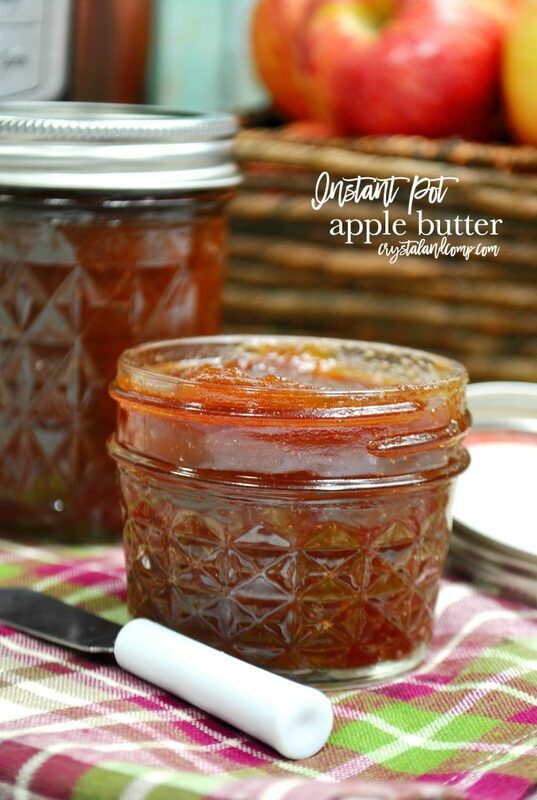 If you’re looking for a fantastic way to use up some of the apples you have on hand, I am going to share with you the best apple butter recipe ever! And, the best part? It cooks in minutes in the Instant Pot. When we first started homeschooling, way back in 2011, I took the boys to a local apple orchard as a field trip. You could pick apples and take them home, but they also sold homemade apple butter using apples from their orchard. I brought it home and smothered the apple butter on pork chops that I cooked in the slow cooker all day long. I am so excited to make apple butter myself now. It can be done quickly in an electric pressure cooker. Peel, core and chop up your apples into small squares. Place them in your Instant Pot. Next, add the water, both sugars, the molasses, spice, lemon juice and vanilla over the apples. Mix it together until well combined. Pop you lid on the Instant pot and press Manual. Set the time to 15 minutes. You want to let the pressure cooker do a natural release for this one. Grab a potato masher and puree or mash the apples in the Instant Pot. You can serve it up now on toast or biscuits, marinate your favorite chicken or pork with it, or just eat it as it is. 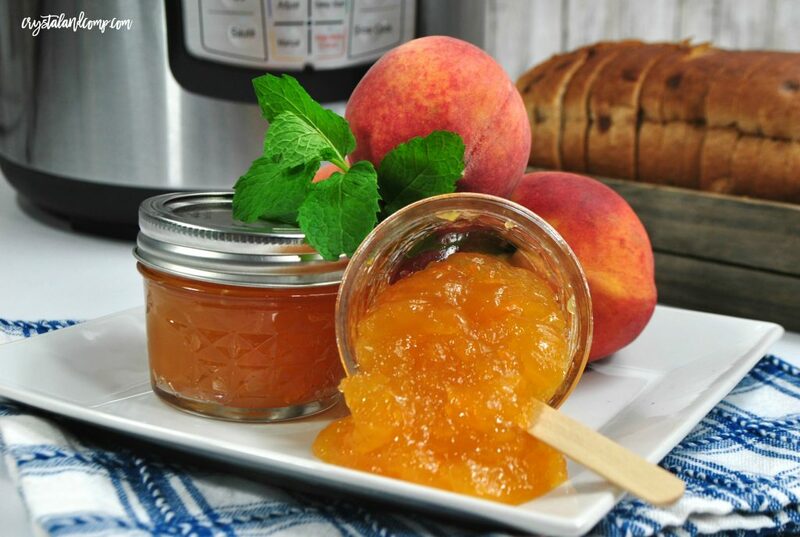 Once it is cool you can also freeze it for up to three months in a freezer friendly container. 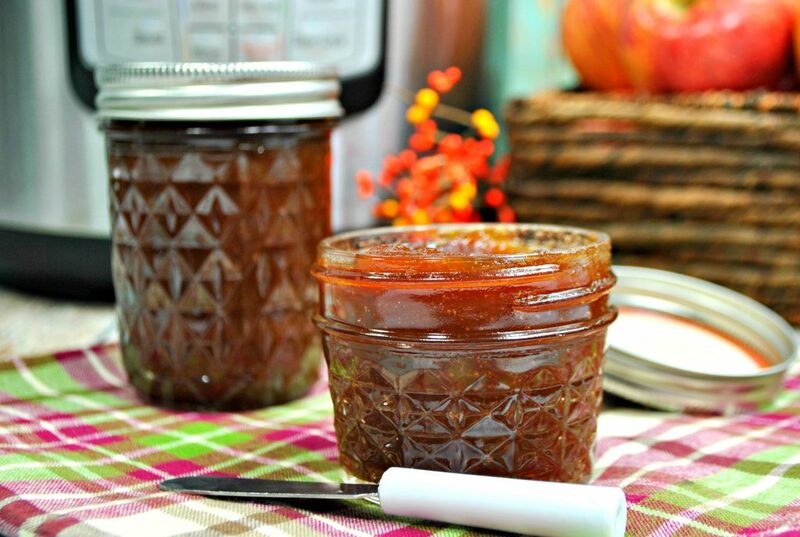 What Can I Make with Apple Butter? 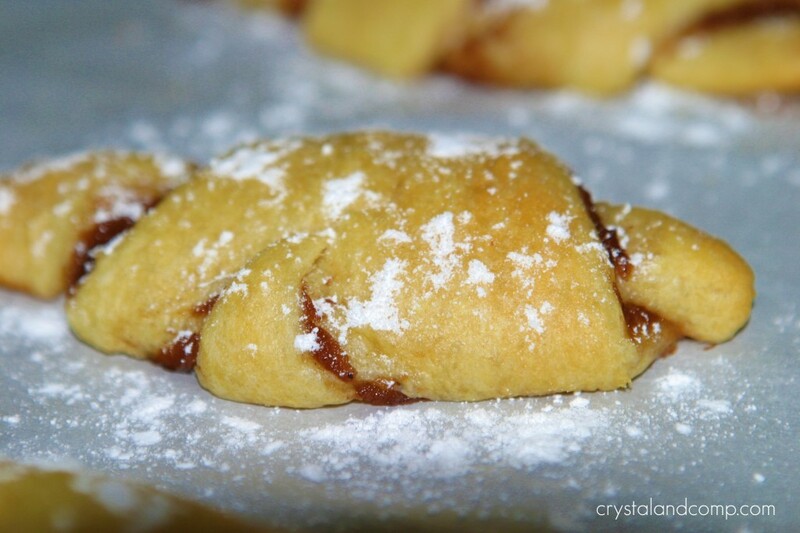 We love making these apple butter crescent rolls. They are the PERFECT fall dessert! These are the slow cooker apple butter pork chops we love. Need Help Getting Dinner on the Table? The struggle is real. Freezer meal planning has changed my life! 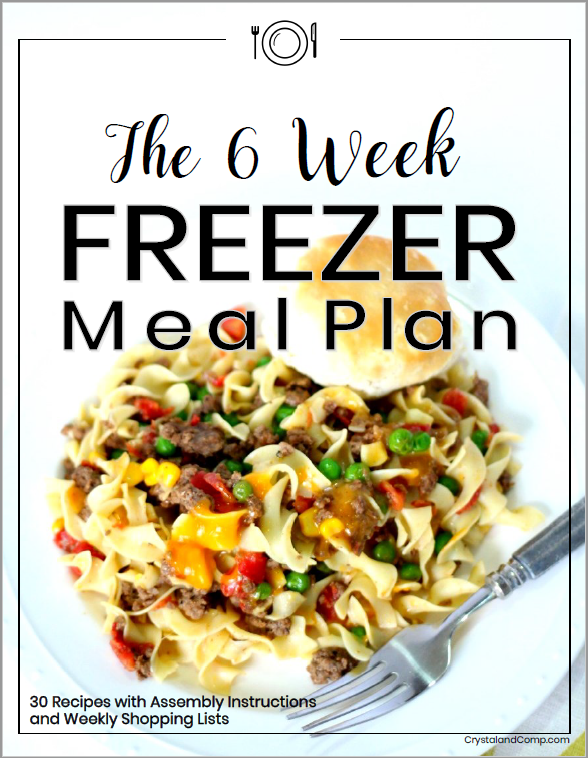 Here is an awesome 6 week freezer meal plan to get you started! 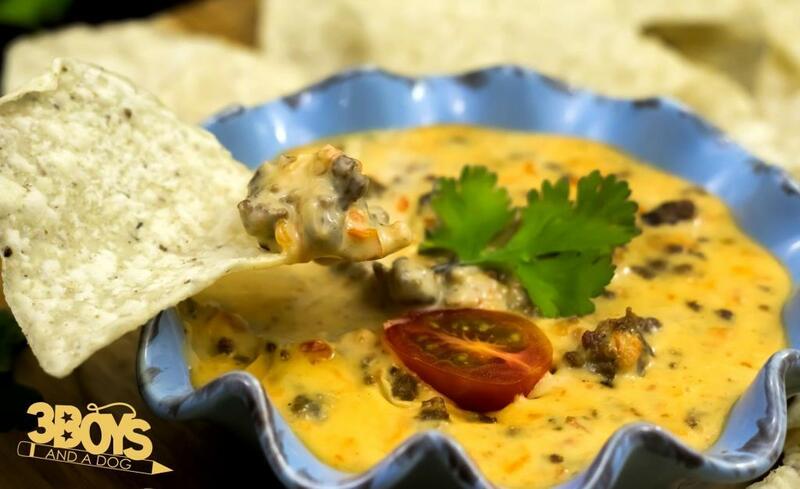 One thing we love to make for a family movie night, to go with taco night or bring to a holiday gathering is Rotel Dip with Ground Beef. 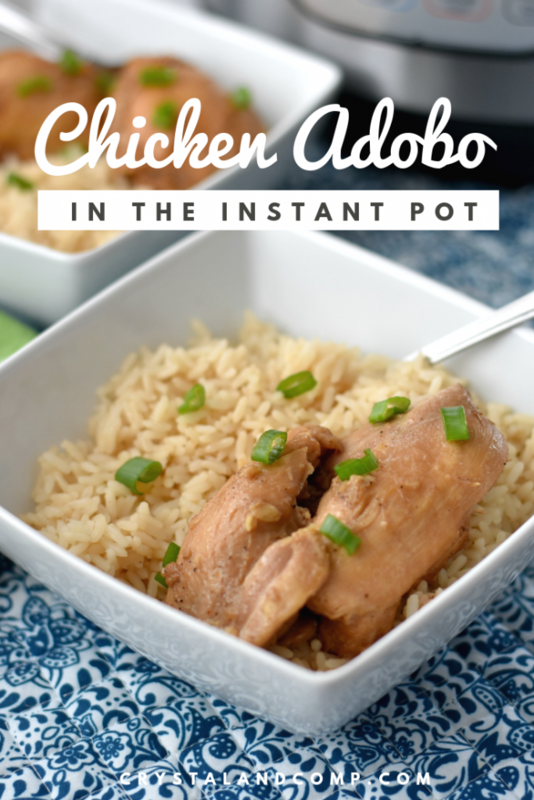 There are so many ways to make this, but have you ever tried using your Instant Pot? Sometimes you have every burner occupied on the stove, the slow cooker is full as well and you just need an alternative. Instant Pot Cheese Dip is super easy and can all be done in one pot. 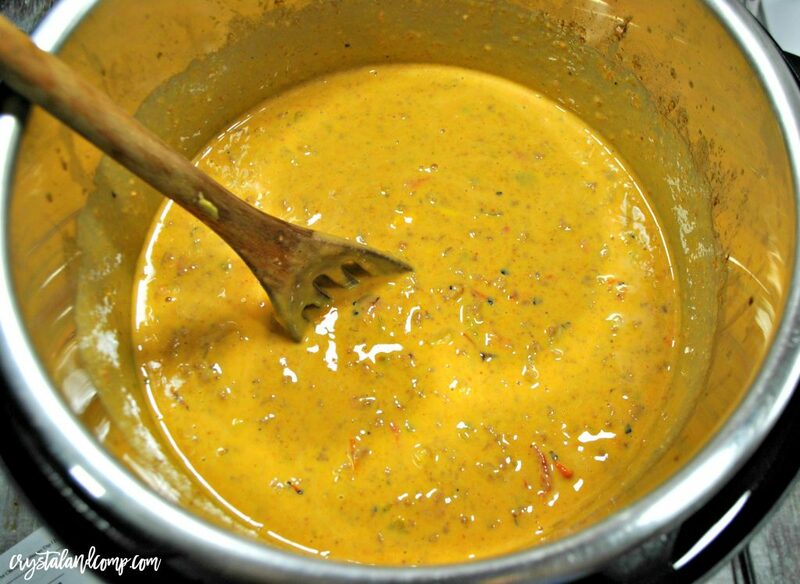 I think you will love this easy RoTel recipe! First gather up all of your ingredients. You’re going to love that you can brown your ground beef right inside your Instant Pot using the saute feature! This Instant Pot recipe is the perfect way to make cheese sauce. I think you will love how easy it is. 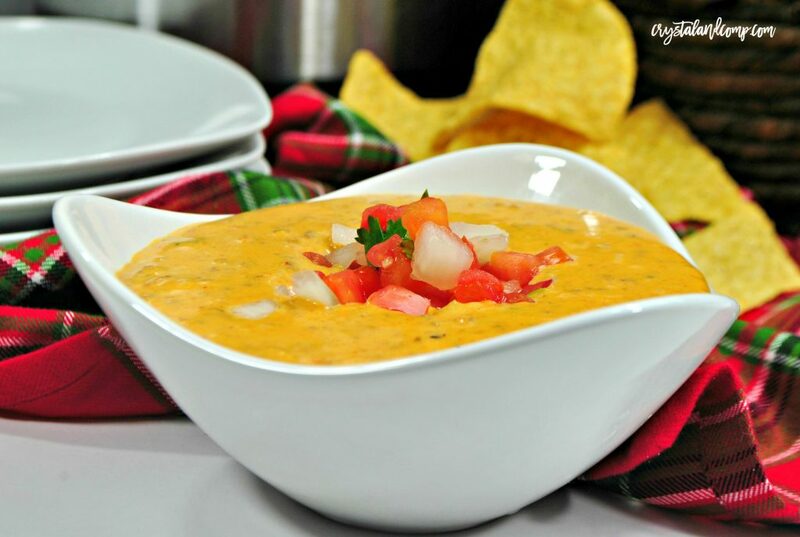 The diced tomatoes, Velveeta, beef, green chilies and spices come together to make the perfect dip recipe. Turn Instant Pot on saute and wait until it gets hot. Add the olive oil to the bottom of your cooker insert. 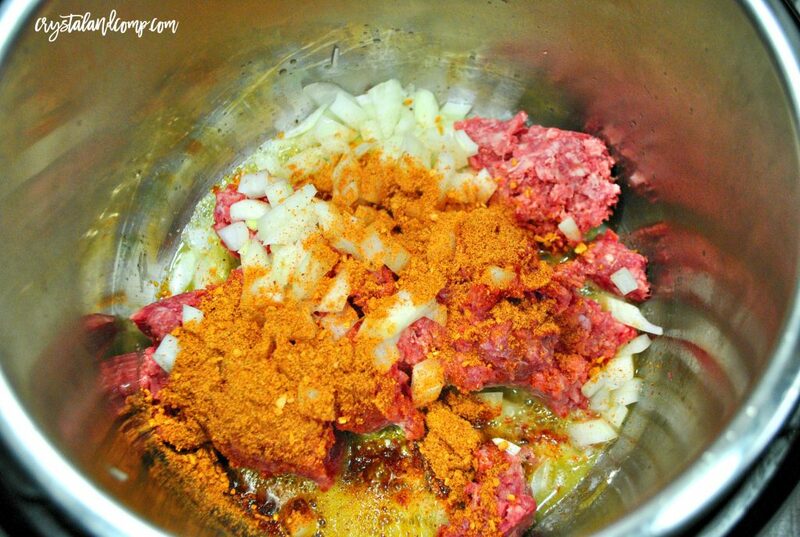 Add the ground beef, your taco seasoning, Rotel, and onions and cook together until no longer pink. What I love about Rotel is that it comes in different variations of heat. You can get mild, regular or hot. Cut the Velveeta into cubes and add it to the insert evenly. Put the lid on your pressure cooker and ensure the vent is on sealed. Cook on manual high pressure for 4 minutes. When the timer goes off, move the vent to quick release. Remove the lid once the release is over and stir the cheese to combine well. It will be smooth and creamy. Look at how delicious this is! We like to serve it with tortilla chips. We dip. You can cover your chips and use it as nacho cheese. You can serve this inside burritos or smother over tour cooked chicken breasts. 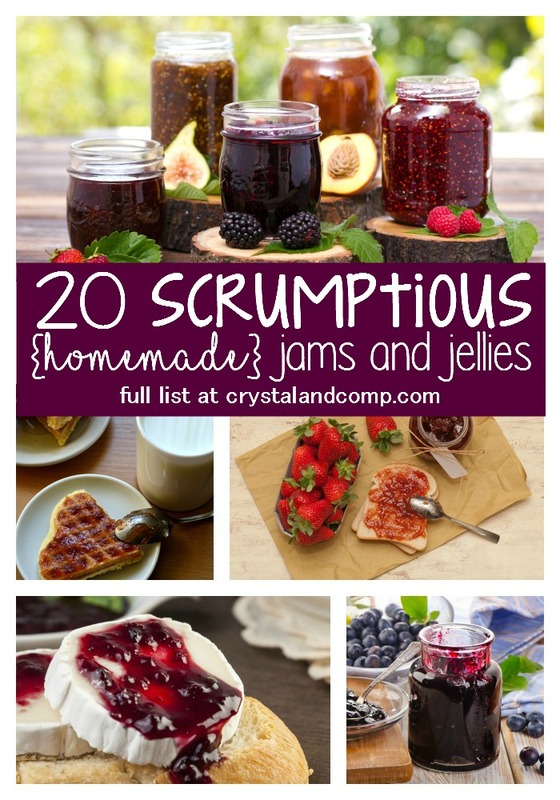 So many uses and just delicious! 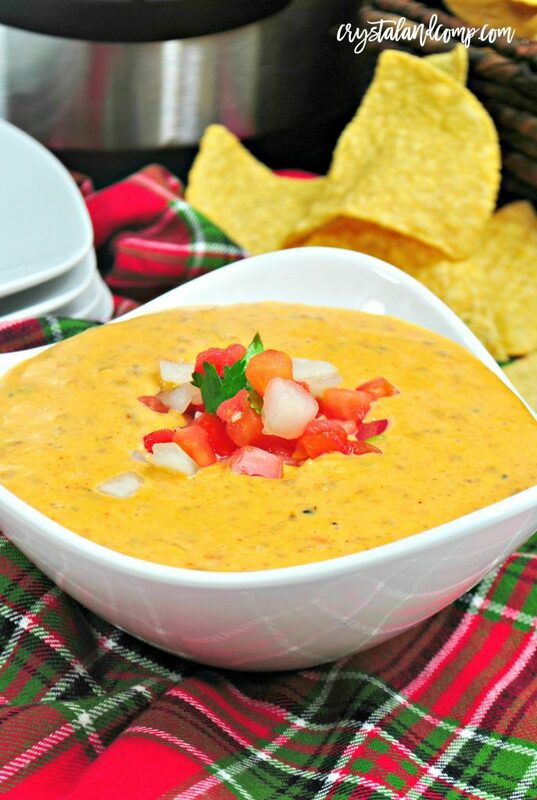 Enjoy your Instant Pot queso dip! The InstantPot is a great way to get dinner on the table fast. Here are twenty-two Whole 30 Recipes that can all be made in your pressure cooker any night of the week. 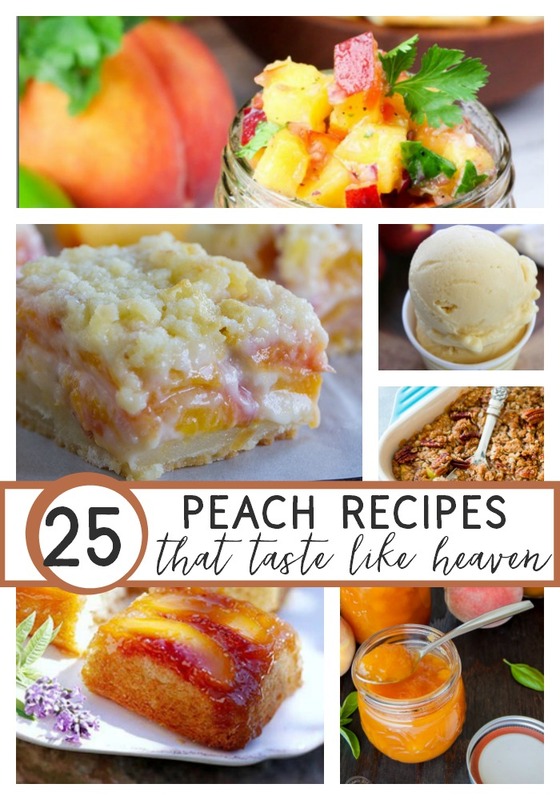 They are especially ideal for busy weeknights! 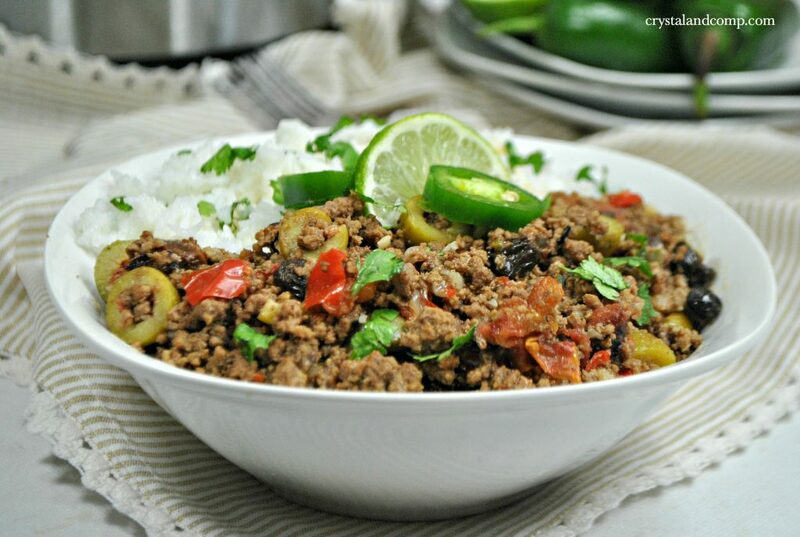 Have you ever made Picadillo in the Instant Pot?